It's easy of you to visit this world just using a snorkel set. So SCUBA divers have little interest in this depth. But there are many tiny fishes.Let me introduce them. 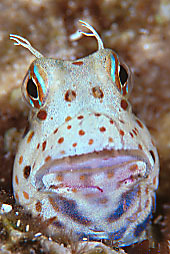 This fish lives in exposed rocky intertidal zone and reef margine.Just its showy and funny face is attractive,but the behavior of it is also so cute.It protrudes its head beyond the burrow and looks around restlessly. Here in Okinawa,this fish lives on the sharrow leaf of Cape Maeda and Cape Zanpa in less than 13 feet. 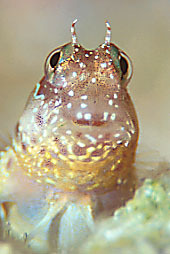 The motion of this blenny is so quick that I often loose sight of it.